The widow of Cuban activist Oswaldo Paya has rejected an official report that said driver error led to the car crash that killed him. Mr Paya, a prominent rights campaigner, was killed in a car crash last Sunday. Other members of his family say they believe another vehicle was involved, although there is no proof of this. On Friday, Cuban officials said the driver was speeding when the car hit an unpaved stretch of road and spun out of control. Mr Paya's wife, Ofelia Acevedo, said she had not been permitted access to the driver and a second survivor of the crash. "I reject this report because it is the official report of the government of Cuba and because I have not had access to this information that they say they have," she told AFP news agency. The interior ministry released a report into the crash on Friday, citing the findings of an investigation team. According to the report, the team's own calculations showed the driver, Spanish politician Angel Carromero, must have been driving at more than 120km/h (75mph). "The incorrect decision to apply the brakes abruptly on a slippery surface caused a tragic accident," the investigative team said in a report. The report added that the vehicle hit a tree, killing Mr Paya and the young opposition activist Harold Cepero, both of whom were seated in the back of the car and not wearing seat belts. Angel Carromero and Swedish citizen Jens Aron Modig, who were sitting in the front of the car, were treated for minor injuries. 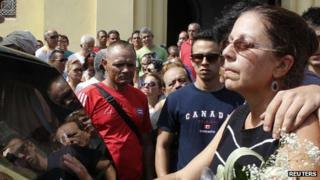 A source at the Spanish embassy in Havana told the BBC that Mr Carromero was moved to a police detention facility in Havana on Friday but that - despite repeated requests - Spanish officials have not had consular access to him since last Monday, nor do they have a copy of the police statement he gave in order to establish a clear picture of events. The source said that on Monday, Mr Carromero appeared very confused and deeply affected by what had happened. Mr Paya's son told the BBC, prior to Friday's report, that his father had received many death threats and that his car may have been forced off the road. Correspondents says that the road is dangerous, being badly sign-posted with cars travelling at high speed. Diplomatic sources have told the BBC that, so far, there does not appear to be any evidence that another vehicle was involved. Oswaldo Paya, 60, was best-known as the founder of the Varela project, a campaign begun in 1998 to gather signatures in support of a referendum on laws guaranteeing civil rights. In May 2002, he presented Cuba's National Assembly with a petition of more than 10,000 signatures calling for an end to four decades of one-party rule. The Cuban government described Mr Paya as an agent of the US who was working to undermine the country's revolution. But the anti-Castro opposition in the US criticised him for being too moderate.